Twin sowing and summer sowing are two techniques that have been developed by Dr Brad Nutt, Dr Angelo Loi and Dr Ron Yates. These techniques lower the cost and risk of failure of pasture establishment and enable farmers to sow pasture without interfering with their cropping operation. Additionally, the sowing techniques do not impact on grazing production and allows the use of on farm produced legume seed or pods with minimal post-harvest processing. Recent surveys conducted in the Western Australian wheatbelt have highlighted that the major constraint to pasture legume adoption is attributed to the high cost and the risk of establishment failure, particularly in dry years. Traditionally, annual pasture legumes are sown in late autumn or winter after the main cropping program is completed. Scarified and inoculated legume pasture seed with high germination levels (70-90%) is sown into paddocks following an application of knockdown herbicide to control established weeds. However, this conventional method of sowing, seriously reduces early winter pasture production for animal grazing as the majority of the early germinating remnant pastures and weeds are removed. Furthermore, adding to the cost of establishment is that the newly sown legumes are usually very slow to grow in the cold winter conditions and require time to establish. Pod or unscarified seed with low germination seed (5-10%) is sown together with grain crops in May/June the year prior to a pasture phase. During summer after the crop is harvested, the hard seed of the legumes breakdowns to germinate later in autumn at the break of the season. Select paddocks after single or preferably multiple non-legume crops (low weed content) and where the use of sulfonyl-urea (group B) or clopyralid (group I) has been voided. Residues of these chemicals can cause legume root damage when only very small amounts are present. Use unscarified hard seed of Bartolo bladder clover or pods of Margurita hard seed French serradella (germination of 5-10%) and drill them in the soil at approximately 1cm deep. Pod or seed could be top dressed pre- or post crop sowing. It is not advisable to sow seed or pods with wheat or barley together as the sowing depth of the cereal would be too deep. Twin sowing should be implemented in the late paddocks of the cropping program. It is highly recommended to inoculate bladder clover seed with granules of group C. Inoculation may not be required for serradella in paddocks with a recent history of lupin production (including blue lupin pastures). 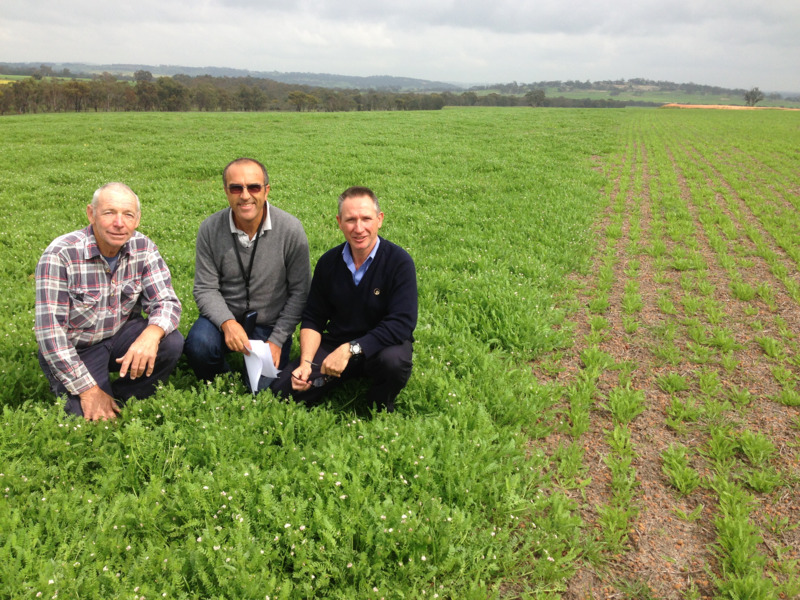 Sowing rates should range between 15-30kg/ha of pods of hard seed French serradella and 20-30kg/ha of unscarified seed of bladder clover. Avoid residual herbicides in any summer weed spraying (for example, sulfonyl-urea and clopyralid based herbicides). Minimise or remove excess stubble prior to sowing to enhance pasture germination at the break of the new season. Fertilize by top dressing either pre or post emergence according to soil test results and recommendation. Redlegged earth mites need to be monitored and controlled as necessary. Apply a suitable grass selective herbicide in mid to late winter. It is often recommended an application of Imazethapyr as a pre-emergence treatment before the break of the season when using hard seed French serradella (do not apply on bladder clover). Winter grazing and/or manipulation with a broadleaved herbicide (Imazamox for serradella and flumetsulam for bladder clover) maybe essential for weed suppression. Summer sowing is similar to twin sowing by using low germination seed or pod but requires a sowing operation in early summer (January-March) after the crop is harvested. It uses the high summer temperatures for the breakdown of the hard-seed to provide a seed bank ready to germinate at the break of the season. Select paddocks with low weed content (after single or multiple non-leguminous crops) and where the use of sulfonyl-urea based herbicides (group B) or clopyralid (group I) has been avoided. Use un-scarified hard seed or pods (germinability 5-10%) drilled into the soil at approximately 1cm deep. Sowing time is critical and should start as early as possible after the crop has been harvested and sown no later than early March. Inoculation must be carried out with granules. It is highly recommended to inoculate bladder clover seed with group C. Inoculation may not be required for serradella in paddocks with a recent history of lupin production (including blue lupin pastures). Crop stubble should be minimised as much as possible prior to sowing to expose seed or pods to the high summer temperatures. Apply appropriate fertiliser at sowing depending on soil test results and recommendations. Winter grazing and/or manipulation with a broadleaved herbicide (Imazamox or Imazethapyr for serradella and flumetsulam for bladder clover) maybe essential for weed suppression. It is often recommended an application of Imazethapyr as a pre-emergence treatment before the break of the season when using hard seed French serradella. 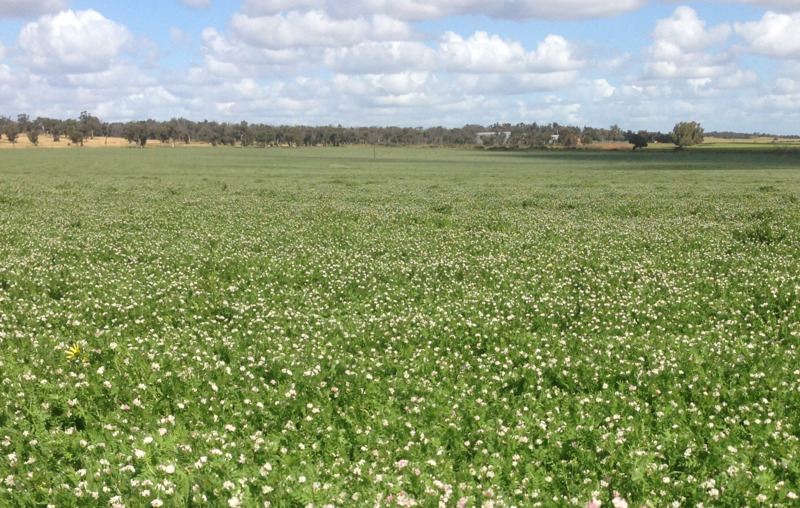 Twin sowing and summer sowing annual pasture legumes (Margurita hard seeded French serradella or Bartolo bladder clover) offer early winter grazing in a mixed enterprise farm. Establishing paddocks by these methods allow the pasture legumes to start growing immediately after the break in which the plants take advantage of the warmer growing conditions in autumn. In contrast, conventional sowing is penalised by the delayed sowing operation (for example, weed control) and the seedlings usually establishing in colder conditions. In addition, both sowing techniques have little interference with crop operations after the break of the season. Results have shown the delay in sowing of pasture legumes by 2-4 weeks can equate to an overall production loss of 2-5 tonnes of dry matter through winter (Figure 1). The twin and summer sowing techniques have the ability to lift the legume component in a pasture that has been degraded through a range of factors such as drought and/or intensive cropping. On a farm without grazing animals, twin sowing or summer sowing can be used to produce a green fallow with a high legume content that can be brown manured to provide high nitrogen residues and maximise the organic matter for the benefit of subsequent crops. Twin sowing reduces the establishment cost because the sowing operation is shared with the crop. Additionally, both techniques contribute to further reduce establishment cost. Firstly by minimising seed processing particularly in the case of serradella where seed extraction is difficult and expensive and secondly, sowing does not require a pre-sowing application of herbicide. Twin sowing: a new technique to reduce the costs of pasture establishment.